Pick-up at your hotel. Van or bus transportation with AC. 1 Buffet meal including a beer and unlimited soft drinks and coffee, inside the restaurant. Water activities in underground river. Access to beach, cove and natural pools. Life jackets and floating tires. Beds, hammocks and rest areas. Safety bags for the 5 rivers route. Toilets, dressing rooms and showers. Xcaret Mexico Espectacular show, a musical journey through the history of Mexico. They are bought directly at the park. Swim with Dolphins and other optional activities are booked directly at the park. Food and beverages outside the restaurant (before and after meal). Only applies in meeting points: Plaza palayacar Center (Starbucks), Plaza Antigua, 10th street with 10 avenue and Bodeguita del medio (34th street with 5th avenue). Children between the ages of 5 to 10 years are considered Juniors / minors as long as their height is not bigger than 1.10 meters (it will be necessary to present minor’s id in some cases, such as passport, school credential, birth certificate, etc.). Wear comfortable beachwear, extra clothing and swimsuit. The sunscreen should be free of chemicals. 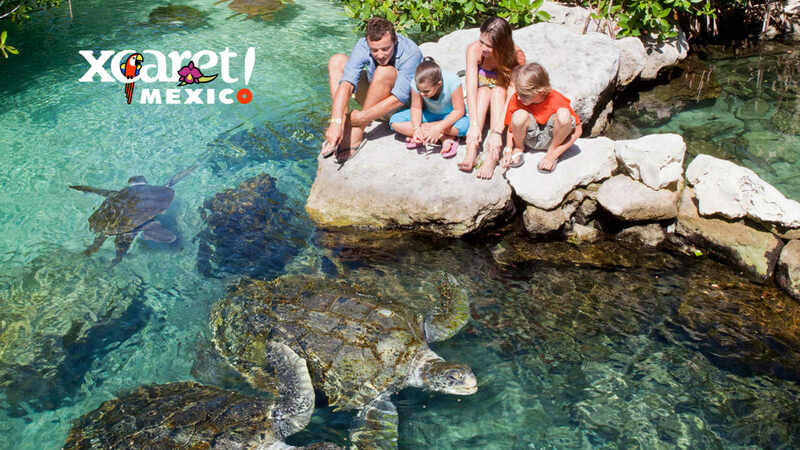 Come relaxed and eager to have fun, to take a beautiful memory of Mexico, only possible in Xcaret! Children from 5 to 11 years old pay half of the adult ticket (ID must be presented at the ticket office of the Park). Children older than 1.40 m but under 12 years old, must present identification to prove their age. $ 75.00 Juniors 5 - 10 Years.